Coins have often been used, officially and unofficially, to commemorate important events. 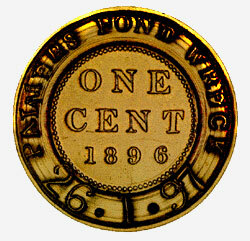 This counterstamped one-cent piece is an example of an unofficial use to mark an event of local significance. On January 26, 1897, a CPR train on its way from Halifax to Saint John was a few minutes late leaving Sackville. It was scheduled to arrive in Moncton at noon. As the train entered the first bend of a sharp S-curve, the passengers braced themselves to avoid being thrown into the aisles. On the second bend, the cars began to vibrate. The train left the rails, rolled down a steep embankment and finally came to rest on the ice of Palmers Pond. Two passengers were killed. After the dead and injured had been attended, the rescuers and onlookers turned their attention to the mail car, which contained about 5.6 tons of bronze cents struck in England and destined for Saint John and Montreal. Eighty boxes of coins had been smashed and the ice on the pond was covered with new, shiny one-cent pieces, in some places 2 to 3 feet deep. By evening the new cents were circulating in nearby communities. Subsequent investigation revealed that all the boxes had been placed in one end of the car and it was generally believed that the wreck was caused by the load shifting. Some of the recovered pieces were privately counterstamped PALMERS POND WRECK 26. 1. 97. The one-cent piece illustrated comes from the wreck and forms part of the National Currency Collection, Bank of Canada.